Check out this video (3:01) on tech groups, request types, and ticket assignment. Request types and tech groups work together to determine how tickets are routed through Web Help Desk and assigned to techs. Web Help Desk uses request types to categorize and route help desk tickets. They define the basic structure of your help desk system. Users cannot submit a ticket without a defined request type. Web Help Desk provides several default request types, but you can define a set of request types that meet your organization's needs. When you create your tech groups, define groups of techs with similar skills and technical expertise, and then map these groups to the request types they will service. A tech group can include multiple levels so that complex or difficult tickets can be escalated to more experienced techs. Tech groups are optional. Small organizations with just a few techs probably don't need to define tech groups. Without tech groups, each ticket is assigned to the lead tech for the ticket's request type. Larger organizations can use tech groups to automatically route tickets to techs with the required skill set. Web Help Desk can assign tickets to group members using a load-balancing or round-robin algorithm, or you can route all tickets to the group manager or lead tech for manual assignment. 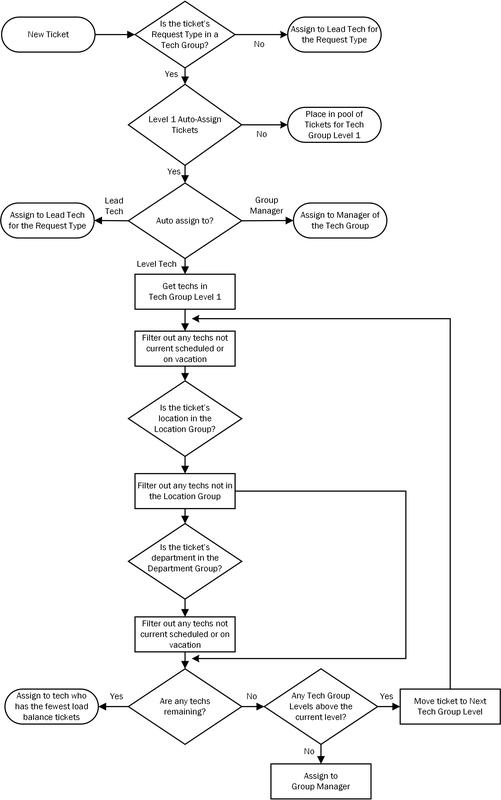 The following diagram shows the logic used by Web Help Desk to assign tickets. Some steps in this process include corresponding paths in the Web Help Desk user interface where you can implement any needed changes.